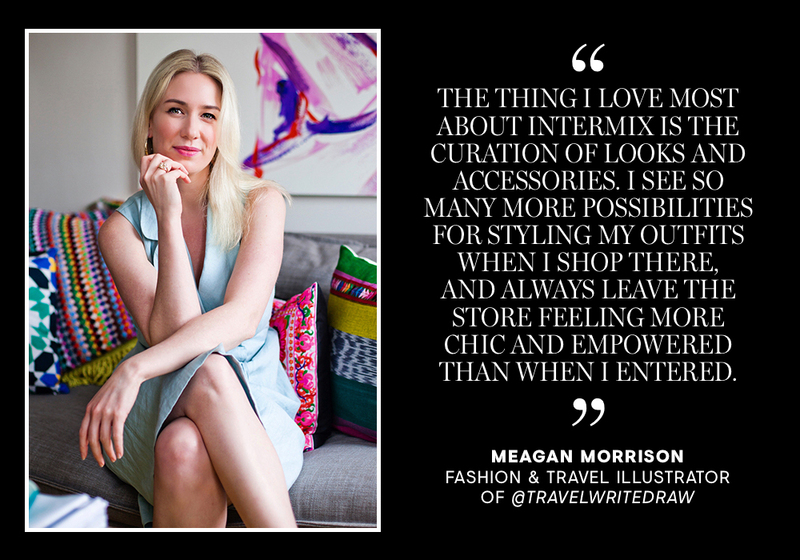 The best part of INTERMIX is you—our clients! You make us who we are today. For our 25th anniversary, we wanted to highlight 25 women (all of which we have been lucky enough to dress) to share their favorite brand memories with us. If you’ve ever pined after a red carpet look, chances are that Sarah Slutsky had something to do with it. The celebrity stylist has worked with clients like Elizabeth Olsen, Sophie Okonedo, and Emma Watson (to name just a few). In addition, she serves as the creative director at Shiffon, a jewelry brand that aims to provide a supportive, powerful network for women, making social good a part of the fabric of their brand. After receiving an Art History degree from UCB, New York City-based photographer Amanda Pratt transitioned into the world of fashion and makeup photography. Her signature brand energetic whimsy earned her a reputation that led her to form relationships with clientele like Saks Fifth Avenue Target, H&M, and INTERMIX, among others. If you are a fashion enthusiast, it’s pretty safe to say you’ve seen Meagan Morrison’s illustrations come across your feed. The New York City-based fashion illustrator of Canadian origin boasts a Bachelor of Commerce from McGill University in Montreal Canada as well as her AAS Degree in Fashion Illustration from the Fashion Institute of Technology in New York. She has collaborated with top fashion, beauty and travel brands including Dior, DVF, Calvin Klein, Montblanc, Emirates Airlines and outlets including Conde Nast Traveler, Harper's Bazaar, Vanity Fair, E! and W Magazine. She’s also an avid traveler (AFAR named her a 2017 ambassador) igniting wanderlust when she’s not in her Williamsburg studio. Her style advice is highly sought after, Alex and husband Michael started their blog, Stylists to a T, after advising friends and family for years about their styling choices. It quickly grew into a styling destination telling followers what to wear, how to wear it, and where to buy it. Alex is a graduate of Parsons the New School and has worked at various fashion houses including Ralph Lauren, Theory, and Emily & Ashley. 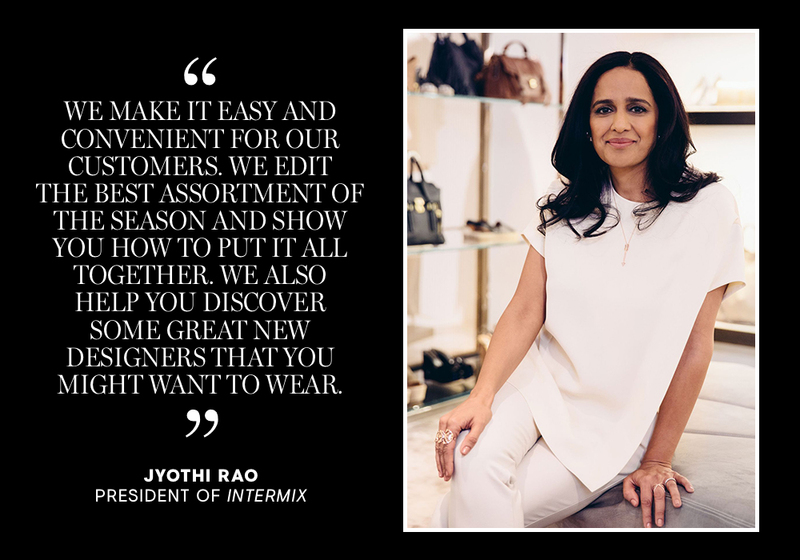 INTERMIX President Jyothi Rao believes her role in the company is to build a vision for the brand. Born in India and time spent residing in West Africa, England, California, Europe, and now New York, Jyothi found her home at Gap when she was a senior at the University of Texas. She returned to the company in 2014, using her love of fashion and numbers to help transform INTERMIX from a brick-and-mortar business into a thriving omni-channel brand.